I say it all the time, and you can probably tell if you follow along on Instagram or the blog consistently, but I am a neutral obsessed girl. 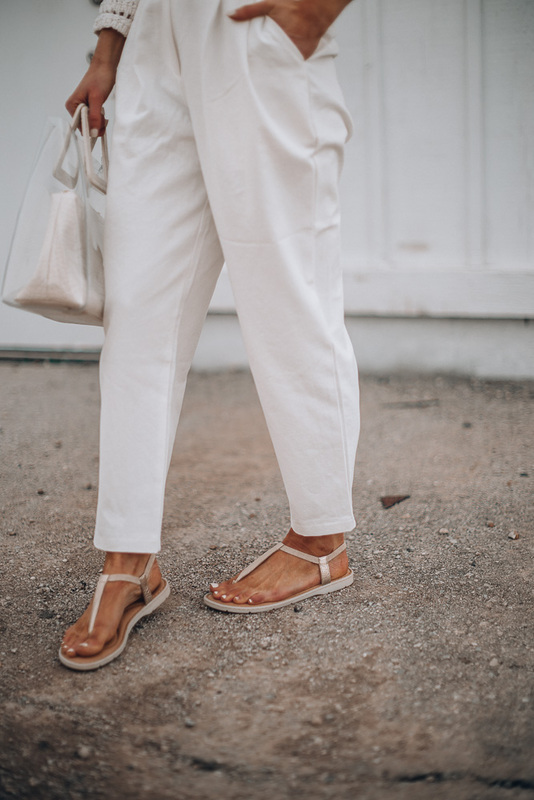 Neutral color palettes are versatile and I’ve just found I get more wear out of something when it’s neutral – especially shoes. From sandals to sneakers, you can never go wrong with a neutral shoe from Born Shoes. I snagged these sandals from Born, and it’s honestly my favorite pair right now. Not only did Born nail the perfect neutral shade to wear all summer long, but you rarely find a thong sandal that’s as comfortable as these. No blisters or rubbing, just style and comfort. They feel like your walking on clouds! For this look, I chose to really dress the sandals up – another thing I love about them. I could easily wear them with a t-shirt dress and ball cap or something chic like today’s outfit. Staying true to the neutral theme, I went with these white high waisted paper bag pants and this loose knit sweater. Both pieces are perfect for that warm but not hot transitional weather we see so much of this time of year. Oh and don’t forget a few extra special accessories. This purse is a favorite of mine right now. You’ve definitely been seeing it on repeat in my Insta feed. I also wore a classic pair of Raybans and these statement earrings. What do you think? Are you a neutral lover like me? Where did you get the sweater YOU ARE WEARING? I am a neutral lover as well, and this whole outfit is such a chic classic! Those Born shoes look super comfortable too! They are seriously the most comfortable shoes I’ve worn in a long time!